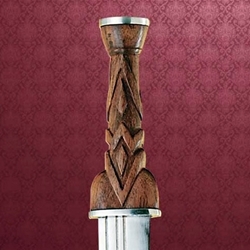 Our Early Scottish Dirk is a direct descendant of the medieval ballock dagger style. The grip form began to change, probably sometime in the late 16th century, but soon developed a form that was purely Scottish. The blade was long and single-edged. Made to use alone, with a shield and sword, or just with a basket-hilt claymore. We have replicated an early version of the dirk. The hardwood handle is carved with a chevron like pattern copied from an original of the same time period. For those with a serious interest in the Highlands, this is a must for any collection. Circa 1550 Includes scabbard. Can be sharpened for additional fee.